If you are searching for how to figure the curvature of the earth in an easy way, I created a spreadsheet just for you. I wanted to put in a mileage number and come out with the distance of inches, feet, and miles so I created this spread sheet to do that. There are 2 formulas. The first formula uses the theorem of Pythagoras. The second one is a quick and dirty formula used by Jeranism and I wanted to compare them to see how accurate the quick and dirty is. It is pretty close but the higher the miles, the more inaccurate it becomes. That is what you will see in the spread sheet. I used the full formula on the calculators that I created below the spreadsheet. 3. Updated sq numbers to ^2. Get the spreadsheet here. Earth's curvature. 2. I added the formulas for the horizon and ft hidden used. 3. I fixed the error with the horizon in ft showing the wrong number. Miles was correct. 4. I added Meters hidden. The video below is a look into the difference between the Horizon, Line of Site, and figuring Earths curvature. It also explains how to use each calculator. 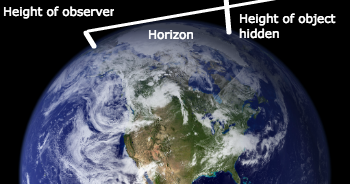 This image shows the observer's height and their horizon. It also shows the object that is in the distance with the height of that object that is hidden by the curve. The top part of this object can be seen. Use the calculator below to determine the curve of an observer/camera using their altitude to the eye of the person/camera. If you are going to enter the distance to the object, don't go above 10,000 ft for the height of the observer. Use this picture below as a reference for the earth's curve calculator that is below the picture. Keep in mind that the earth's curve is 360 degrees. You should see the same curve all the way around at that distance. [ ] Line of site to object 2 in Feet. [ ] Line of site to object 2 in Miles. Make sure the 1st, largest degree is 90 degrees. 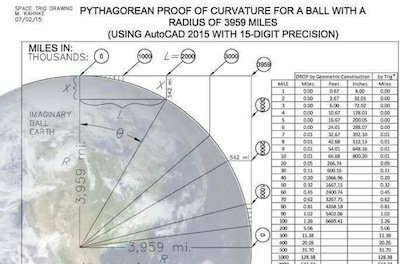 Formula for distance on Globe. mi/tan'paralax. Subtract 180 - 90 - the new number above = p (paralax). [ ] Total feet in distance. [ ] Total miles in distance. 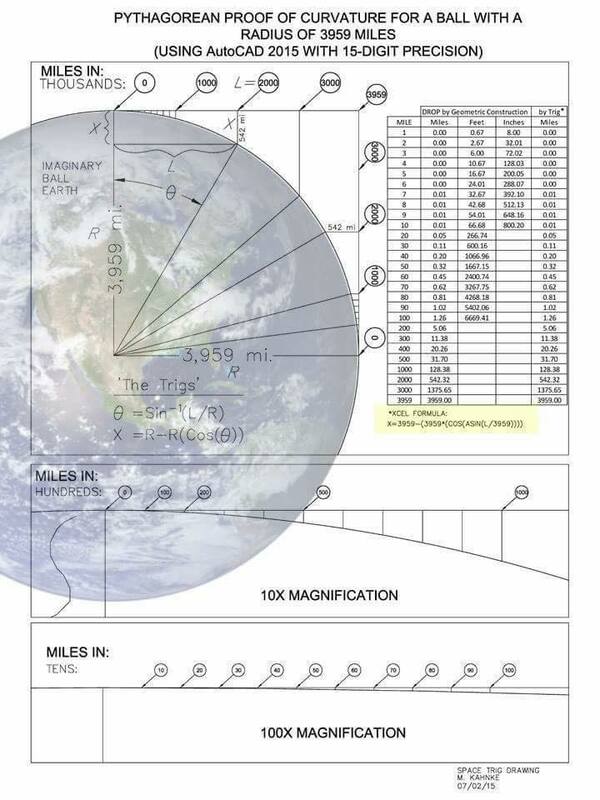 [ ] If Globe, Total miles in distance. Want to share information about the Flat Earth? Share your information, videos, and pictures proving the Flat Earth.